After 13 July 2015, Syriza's Greece and, for that matter, the creditors have two choices. Modernise the Greek state; or let Greece default and risk disintegration not just of EMU/EU but also Nato. 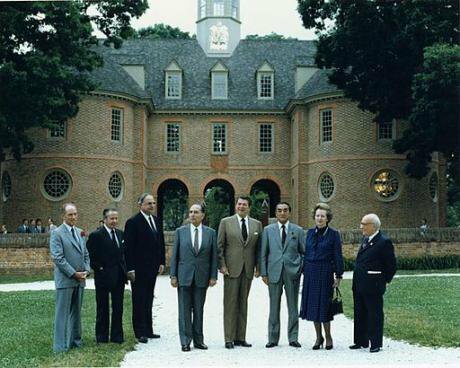 Mitterand at the G-7 summit in 1983, fourth from left. Wikicommons. Some rights reserved.When Francois Mitterrand's Socialists assumed power in France in 1981 with a Keynesian programme in hand, he and his coalition partners, the Communists, were forced to backtrack. The French currency could not defend its exchange rate and as inflation spiralled out of control, Mitterrand began introducing neo-liberal reforms - the famous U-turn of 1983. Andreas G. Papandreou's Pasok in Greece put up more of a resistance to neo-liberal globalisation, but its programme was far more radical than Mitterrand's. Several discontinuities before and after it assumed office occurred and a transmogrified type of socialism took shape in Greece in the 1980s, the most peculiar aspect of which was the introduction of a national health system and other welfare reforms, financed via domestic and external borrowing, rather than taxation as is the norm in the west. Obviously, this worsened the country's public debt situation, bringing it up to 100% of GDP. Let us dig a little further. Before they conquered power in 1917, Lenin's Bolsheviks advocated a direct passage to socialism (equivalent to those years of the so-called "dictatorship of the proletariat"); confiscation and nationalisation of all land and property and all power to the workers' and peasants' councils (the Soviets). Lenin, in particular, despised Taylorism, which in a series of articles in 1913-14, he characterised as the most inhuman capitalist way of organising industrial relations. What did he do after 1917? He introduced the famous ‘New Economic Policy’ and ‘tax in kind’, advocating co-existence between the public and private sectors of the economy; began praising Taylorism as the advanced method Soviet Russia most needed in order to increase its productivity, and invited English capitalists to invest in his country through diplomatic channels and various interviews he gave in the then Manchester Guardian. Interestingly, Lenin then praised Plekhanov as the best Russian Marxist philosopher that its youth should study (before 1917, Plekhanov and other Marxists of the Second International were dubbed ‘renegades’ and ‘traitors of socialism’). And here comes Syriza. Its Salonica programme of September 2014 was a moderate Keynesian set of proposals aiming at alleviating the humanitarian crisis and gradually raising the minimum wage. At the same time, it advocated balanced budgets, administrative reform and withdrew its opposition to Nato. It was expected that the ECB would support this programme, especially since a Syriza government, like all eurozone governments, lacked Keynesian instruments to implement Keynesian policies. Syriza comes to power with a mild reform and anti-austerity agenda believing that tough negotiations with the troika would bring positive results. Syriza, among others, had hoped that a part of the country's debt would be written-off and some of the cash flow coming into the country would go to productive investment. The effort was very brave but brought no results. This was because the so-called ‘EMU rules’ do not allow flexibility. And they do not allow flexibility because the institutional and ideological bias upon which EMU is based reads as follows: no wage growth, anti-inflationary policies, budgetary discipline and export-led growth. In other words, the rules are set according to Germany's successful neo-mercantilist economic story which, contrary to the rules of the EU and EMU, suppressed wages for years in order to make Germany a surplus country and improve its competitive position within the EU and internationally. Germany is now exporting austerity as it first imposed austerity on its own workers. But this austerity is bound to take on different shapes and forms across the eurozone and beyond, simply because the levels of economic and political development in each country are vastly different. All EU/EMU countries, and also all candidate countries, are subject to the same discipline and neo-colonial controls. This is what Syriza failed to break down in the negotiations and, despite the resounding and heroic victory of the NO vote in the anti-austerity referendum of 5 July, it was in the end forced to backtrack, submitting to creditor power. The deal Syriza took is recessionary; it has no chance of improving the Greek economy as it stands; and, as the IMF predicts, the debt/GDP ratio would increase under the new agreement. More to the point, Syriza, like all the left radical movements in twentieth century European history, had to conduct a massive retreat, capitulating on every single point it was making when in opposition. Effectively, it signed up to a new recessionary Memorandum of Austerity, which includes a €50bn privatization fund that will be replenished by selling public assets and a target of 1% primary surplus for 2015. So far, commentators in various venues have said almost everything about the Greek/eurozone crisis. From Bloomberg analysts to Financial Times' journalists, and from scholars such as Leo Panitch and Sam Gindin to Paul Krugman and Joseph Stiglitz, all the major issues have been tackled and explained competently. Obviously, without Keynesian instruments at the national level and without a European federal state at the European level you cannot have any form of Keynesian policies. Too much reliance on the ECB - which, first and foremost, is a bank - and the "good will of European partners", coupled with lack of institutional preparation to return to a national currency, has brought Syriza's negotiating team to a standstill. Others, quite rightly, have argued that there has been no real negotiation since Syriza assumed office back in January 2015. The Germans, this argument goes, wanted regime change as they could not agree with the Greek finance minister's reasonable demands -- which included restructuring of the debt, ie debt relief. In fact, this insight is correct: after the referendum of 5 July, the Greek PM sacked finance minister, Yanis Varoufakis, in order to keep his cabinet in place and avoid being pushed out by the creditors (mainly via financial and media warfare and permanently blocking liquidity to the Greek banks). Yet, what we have not seen being tackled is the following really dramatic issue. The creditors seem to be of the opinion that there is a Greek state in place that can implement and a Greek society that can accept the new austerity measures. This is reminiscent of the gruelling rationale behind America's various wars post-9/11, but also before: we go to Afghanistan, Iraq and elsewhere to bring about the lights of liberal democracy, human rights and free market capitalism. This indicates total ignorance of the concrete societies and states they supposedly want to change and improve. In fact, wherever American power went, it only made things worse. Greece and the European periphery should be seen in the same light. Greek political elites, mixed with big comprador and corrupt interests, as well as the institutional materiality of the state as such, have always been fragmented, deeply inefficient and in the service of clientelist, corrupt and nepotistic deals and practices. But Syriza did not inherit just this. Syriza inherited a non-state, a completely dilapidated administrative apparatus with civil servants shivering in fear over who will be next to lose his/her job. Society itself, with 27% unemployment and 57% youth unemployment and unpaid salaries for months, swims in this strange mixed mood of anger, radicalization and demoralisation. Recent administrative reforms in municipalities (the "Kapodistrias" and "Kallikratis" plans) caused havoc, further distancing the citizen from the state. Add to this the factional warfare within Syriza and the government and you will have one of the most inefficient ‘ruling’ machines in the west. In other words, Syriza's state cannot reach the 1% primary surplus fiscal target; it will be unable to effect privatizations and other neo-liberal reforms required by the creditors in order to receive bail-out funds. The new anti-austerity package will fail. Even Syriza MPs who voted for it in the parliament may well boycott it. The PM himself said publicly that he does not believe it is a good deal. Equally and arguably, for the same reason, a debtor-led default and exit from the eurozone will fail. A transition to the national currency requires a strong and well-organised state apparatus to lead an impoverished society through hardship to eventually achieve renewal and something positive at the end of a long and arduous journey. We argue that there is not enough state capacity in place to hold sway over the implementation of a new austerity package or indeed to buttress and deliver Grexit. So what is to be done now and in order to avoid a new election in Greece that is bound to achieve nothing of substance? We can see only two solutions. The first entails a substantial write-off of the Greek debt of about 40% and a concrete development plan for the country which should take place in parallel with an overhaul of the state machine. Austerity measures may continue but not without immediate cancellation of a large part of the debt, a developmental perspective and modernisation of the state administration. Syriza's negotiating team must put forth these two points as non-negotiable items for the implementation of the new austerity agenda. To a certain extent, this is also a choice, perhaps the only choice, for Europe. The common currency has no chance of surviving if the union is unprepared to move towards a federal state allowing debt write-offs of the periphery, the same way that the American North forgave the debt of the South after its victory in the Civil War. That is how the USA happened. Here, Greece and the eurozone crisis in general offer the creditors a golden opportunity to build a European federal state with the European taxpayer guaranteeing payment of the weaker economies of the union. It is as simple as that. But Germany may stick to its neo-mercantilist policy of low inflation and low wages and refuse debt relief. What, then, for Greece and, for that matter, Europe? If this eventuality becomes reality, then Greece must default on its debt obligations, restore the independence of its central bank and introduce a new currency in stages. For this to happen successfully, the current Syriza government must open up the debate among civil actors, go public with the problems it faces in terms of state capacity and reform and invite all Greek people to assist in rebuilding the state and society on the basis of a new developmental agenda. Here, the Greek government must nationalise the banks; pursue a courageous policy of import-substitution; build on the existing strengths of its economy and modernise all these sectors (aluminium and cement industry, tourism, fishery, solar energy, agriculture and biological agriculture) - SMEs, which are the backbone of the Greek economy, need special protection innovation techniques and incentives for developing new patents – and it must re-design the state apparatus, commencing from the drafting of a new constitution. Given the level of inflation that will ensue and the devaluation of the new drachma, imports of raw materials and pharmaceuticals will have to be negotiated with the EU and Russia. Also, the EU, the USA and Russia should be in a position to assist with possible challenges to Greece's sovereignty by Turkey. It looks as if this will also be the only choice left for Europe, in the eventuality that it fails to move towards a federation: to assist Greece to survive its exit from the EMU, because an impoverished failed state with hundreds of thousands of migrants and on the brink of war with Turkey either in the Aegean or in Cyprus will blow up not just the EMU but also the EU and Nato itself. [i] Vassilis K. Fouskas (in Greek) Populism and Modernization. The Exhaustion of the Third Hellenic Republic (Athens: Ideokinissi, 1995). The approach suffers from some problems that we were unable to see back then but, overall, it captures many of the developments and structural tendencies inherent in any radical political perspective that attempts to disregard systemic constraints inherent in the national and international political economy.